This tutorial is about Dragome version of the same crud grid application. We are using a Java server side service for interacting to a embedded database, through Hibernate for ORM mapping. For UI construction we are using Component Builders mechanism provided by Dragome, which handles several similar concepts to AngularJS framework: two-way data binding, switch/case template approach, show or style components using expressions, automatic detection of model changes, event handling, template repeaters with filtering and ordering capabilities, etc. The same application could be achieved using components directly but is would be more verbose and more difficult to implement in order to get same data binding advantages. It handles interactions to ORM by EntityManager, such as finding, removing, saving and updating entities. Also it provides metadata for both entities Place and People. See how to use services here. Our first setup is about creating a CrudGrid instance, that's the main model we are going to use, passing it which entity we want it to show. Then for start building all components we will use a ComponentBuilder constructed with currentVisualPanel, where all components and subcomponents will be hanging on. To see how to use templates take a look atTemplate Engine. A Textfield is binded to filter property of crudGrid instance using toProperty method, we've previously chosenVisualTextField component to represent this value in view. 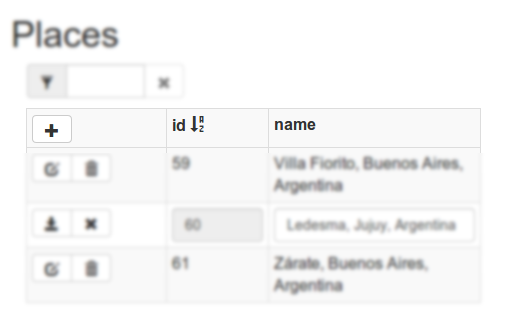 In "remove-filter" case we also add a condition to make it disable when a expression is satisfied. For "add-mode-toggler" we also add a condition but in this case for styling purposes, each style provided will be applied whenever "accordingTo" boolean expression takes true or false value. 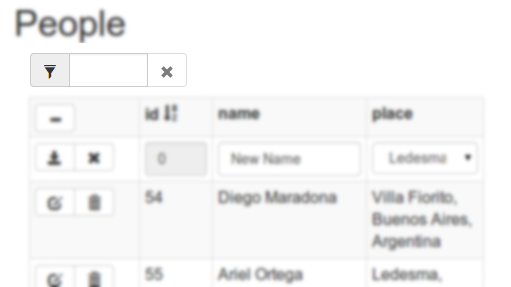 At this point we need to create each column header with: sorting behavior, configured style, and showing its name. 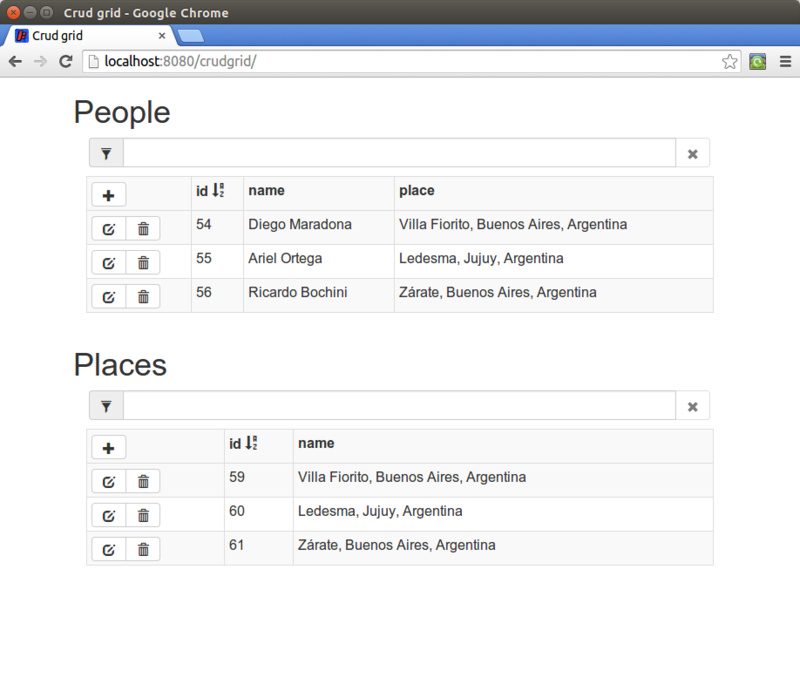 For repeating "table-header" template for each column in crudGrid.getColumns() we use "repeat" method. The whole UI is interacting with a model called CrudGrid, that is in charge of storing the information, performing actions over model, communicating to server service, and providing some tools to help builders to create the UI. This class is totally decouple from Dragome UI creation, builders, methodlogger or any framework specific mechanism.